The latest in the occasional series in which Matthew Turner traces the journeys of Marvel superheroes from four-colour panel to shiny DCP. Spoilers for Ant-Man, after the jump, obvs. Come back after you’ve seen the film. In my previous Comics to Screen pieces for MostlyFilm, I’ve looked at the relationship between the various Marvel movies (including Thor, Captain America: The First Avenger, The Avengers, The Amazing Spider-Man 2) and their comic book origins, with a focus on the filmmakers’ attempts to strike a balance between pleasing an existing comics fanbase and appealing to newcomers. I’m going to do the same for Ant-Man in this post, but it’s worth pointing out that the game has significantly changed since the first phase of what are now known as the Marvel Cinematic Universe (or MCU) movies, in that Marvel are now in a position where they can afford to take a few risks on lesser-known properties, such as last year’s Guardians of the Galaxy. Ant-Man falls into that category – in the grand scheme of MCU movies going forward, it really doesn’t matter whether it’s a hit or not, although, fortunately for Ant-Man fans everywhere, it appears that it is. A few background facts first. Ant-Man has never been one of Marvel’s top tier superheroes, so his pre-existing comics fanbase is significantly smaller than that of, say, Captain America or Iron Man, even before the release of the first Iron Man movie. Ant-Man has also undergone several identity changes in his career, as we’ll see below, but throughout Marvel history, he’s usually been confined to a supporting role in the Avengers, despite the fact that he was a founding member of the original team back in 1963. My own comics credentials on the table: I’m a relative late-comer to Ant-Man comics, so my knowledge largely stems from reading the first volume of his original 1960s adventures in a collected edition that a friend (name-drop removed [it was Barack Obama – ed]) was throwing out, though I’m familiar with his early Avengers appearances. The character of Hank Pym – brilliant scientist alter-ego of the superhero Ant-Man – was created in January 1962, by editor / plotter Stan Lee (who makes his customary cameo appearance in Ant-Man), scripter Larry Lieber and artist Jack Kirby. He first appeared in issue #27 of Tales to Astonish (nicely referenced with a line in the Ant-Man script), minus his costume and helmet, in a story called The Man In The Ant Hill, in which Pym invents a shrinking serum, uses it on himself and is subsequently chased by ants. This story was essentially intended as a one-shot rip-off of the 1957 movie The Incredible Shrinking Man. 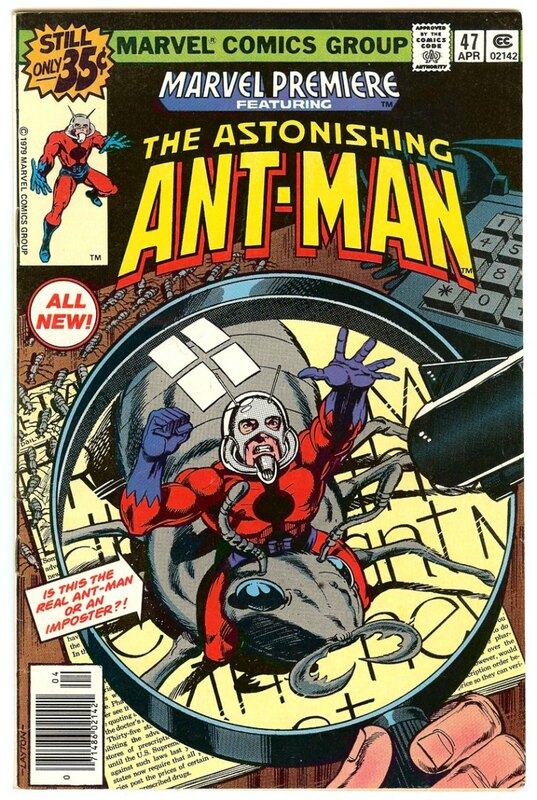 However, Lee liked the character, so Ant-Man began his own run in Tales to Astonish in issue #35, at which point Pym donned his red and black Ant-Man costume, designed a cybernetic helmet to allow him to communicate with ants and became a fully-fledged superhero. Nine issues later, he was joined by his girlfriend-and-eventual-wife Janet Van Dyne (aka The Wasp) and the two appeared as a crime-fighting super-duo together throughout the series, as well as appearing in various line-ups of the Avengers from September 1963 onwards. The Tales to Astonish run came to an end with issue #69 in July 1965, at which point the pair only appeared in issues of The Avengers. In the movie, Michael Douglas plays Hank Pym, the original Ant-Man, who is now retired from the superhero game, though we see him fighting alongside The Wasp (they don’t bother to cast her, since she’s only seen briefly with a helmet obscuring her face) in a sixties flashback. Pym acts as mentor to Paul Rudd’s cat burglar Scott Lang, teaching him how to use the Ant-Man suit and enlisting his help in stealing shrinking technology from his former protégé, Darren Cross (Corey Stoll). Aside from making Pym’s character older than he is in current editions of the comics (roughly the same age as Tony Stark), the film is fairly faithful to Pym as far as comics history is concerned. He’s the creator of the Pym Particles (responsible for shrinking and growing) and the designer of the original Ant-Man costume and helmet, as well the technology to grow and shrink various other objects using throwable discs. Though the details of their relationship are left deliberately vague, Pym was indeed married to Janet Van Dyne, who is now believed dead, after sacrificing herself to defuse a nuclear bomb in the aforementioned flashback sequence. The movie version of Pym has a grown-up daughter, Hope Van Dyne (Evangeline Lilly) who has no counterpart in the mainstream Marvel comics universe (she does exist in the MC2 comics universe). The movie is primarily about Scott Lang and we’ll get to him in a moment, but it is worth pointing out just how badly Hank Pym has been gypped out of his comics heritage by the MCU. Firstly, as mentioned above, he and The Wasp were founder members of The Avengers, alongside Iron Man, Thor and the Hulk (this egregious snub is corrected by the excellent cartoon series Avengers: Earth’s Mightiest Heroes, of which more later). Secondly, one of Pym’s key achievements in the comics is the creation of the sentient robot Ultron, who subsequently became a long-running Avengers villain and was responsible for the creation of The Vision. However, in the recent Avengers movie, it’s Tony Stark who creates Ultron and Pym doesn’t get so much as a name-drop. It’s also worth noting that Pym is one of Marvel’s more complex characters, suffering from a multitude of identity crises. Even in his own Tales to Astonish run, Pym ditches the Ant-Man persona early on, preferring to operate as Giant-Man from issue #49 (November 1963) onwards. Other Pym identities include Goliath (Avengers #28 / May 1966) and Yellowjacket (Avengers #59 / May 1968), who we’ll get to a bit later on. Pym has also had his share of mental stability issues – one of his most famous storylines saw him hitting Janet, an act that led to their subsequent divorce. However, there’s no hint of that mental instability in the movie. In the movie, Paul Rudd plays cat burglar Scott Lang, who ends a three year jail stretch and vows to go straight for the sake of his young daughter, Cassie (Abbey Ryder Fortson), who lives with Lang’s ex-wife (Judy Greer) and her new partner (Bobby Cannavale). However, after he’s unable to hold down a steady job, Lang is tricked into breaking into Pym’s house and stealing the Ant-Man costume, after which Pym approaches him and persuades him to use the suit to steal back his shrinking tech. In the comics, Scott Lang is indeed the second incarnation of Ant-Man and the movie has stayed remarkably close to his comics origin. Lang first appeared in Marvel Premiere #47 (April 1979), in a story called To Steal An Ant-Man. In the comics, Lang is a former cat burglar turned electronics expert who has worked closely with Tony Stark (Lang made a brief appearance in Avengers #181 (March 1979), installing a security system in Avengers Mansion, setting up his Marvel Premiere appearance the following month). The comics version also has a daughter called Cassie, though in the comics, she’s seriously ill, forcing Lang to turn to burglary in order to raise money to save her life – he ends up with the Ant-Man suit after robbing Pym’s wealthy-looking house. In the comics, Lang’s Ant-Man does indeed battle Darren Cross (see below) and at the end of the fight he meets Hank Pym (in costume as Yellowjacket), who tells him he’s been watching him all along and, hey, why doesn’t he just keep the Ant-Man costume and become the new Ant-Man? 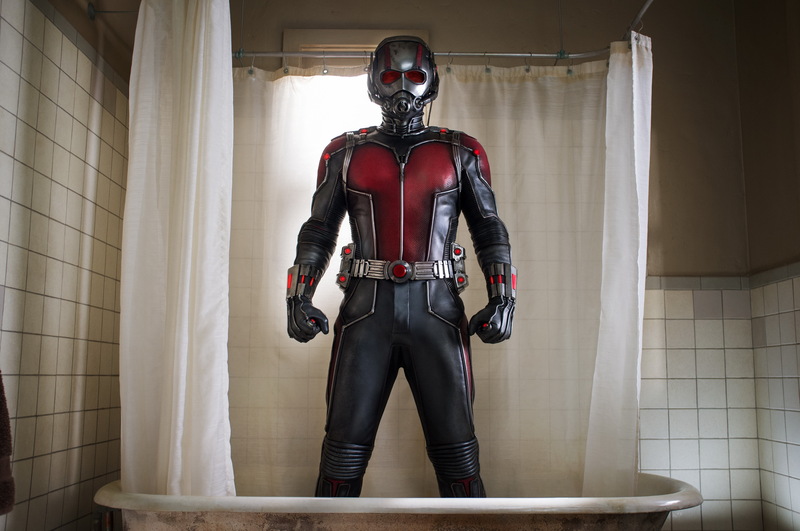 In terms of lifts from the comics, both the original break-in scene and the subsequent sequence where Lang tests the Ant-Man suit for the first time (in his bathroom) are taken directly from To Steal An Ant-Man, while Pym mentoring Lang occurs in later issues of Avengers. Incidentally, the Avengers, Earth’s Mightiest Heroes cartoons also have an episode called To Steal An Ant-Man, which serves as Scott Lang’s origin story and is very similar to the above – he’s a former burglar turned electronics expert who steals Pym’s costume because his daughter has been kidnapped by a villain named Cross (Darren’s cousin, William), and Pym lets him keep the costume after helping him save his daughter. The villain in the movie is Corey Stoll’s Darren Cross, a former protégé of Hank Pym, who’s been trying to replicate Pym’s shrinking technology. Cross’s bald head and mad scientist-like demeanour are possibly inspired by Egghead, one of Ant-Man’s most famous adversaries. In the film, Cross eventually perfects the shrinking technology (though at an apparent cost to his sanity) and dons the Yellowjacket costume, effectively turning him into a costumed supervillain. In the comics, Darren Cross is (or was intended to be) a one-off villain, making his only appearance in To Steal An Ant-Man, where he has a genetic mutation that has given him super-strength and increased size, but also causes him to repeatedly burn out his heart, requiring regular transplants. Cross supposedly dies at the conclusion of To Steal An Ant-Man, but comics being what they are, he was ret-conned back into existence years later. As for Yellowjacket, in the comics he’s one of Hank Pym’s alter-egos (along with shrinking / growing powers) and is basically a good guy, although he’s also symbolic of Pym’s mental instability, making his first appearance after Pym has a schizophrenic episode and frequently attacking the Avengers. The Earth’s Mightiest Heroes cartoon follows a similar tack, introducing a vigilante called Yellowjacket who is eventually revealed to be Pym, following a breakdown after being seemingly killed in an explosion. As mentioned above, Janet Van Dyne appears only briefly in Ant-Man, fighting alongside Pym’s Ant-Man as The Wasp, complete with winged costume, in a flashback sequence. It transpires that she may not, in fact, be dead after all – to defuse the bomb, she had to shrink to microscopic size and in doing so, she got lost in what the film refers to as the quantum realm (in the comics it’s usually referred to as the microverse). After Lang survives a trip to the quantum realm, there’s a strong hint that Pym intends to explore it for himself, suggesting that the search for Janet/The Wasp may form a key part of the Ant-Man sequel, if there is one. It’s certainly an interesting idea, plus the quantum realm being unaffected by time means that she wouldn’t necessarily have to have aged. (Douglas is on record as saying he wants his real-life wife Catherine Zeta-Jones to play Janet, which isn’t a terrible idea). It’s also not without a basis in comics history – the microverse has been used in a similar way, as a get-out clause for The Wasp’s apparent death, in the recent past. In the meantime, however, the mid-credits sting at the end of Ant-Man has Pym showing Hope a Wasp costume and telling her it’s time she followed in her mother’s footsteps. Evangeline Lilly has apparently signed a multi-picture deal with Marvel and it’s likely she’ll appear in future Marvel projects even if they don’t make an Ant-Man sequel. Personally, however, I hope they do get to make a Wasp-centric Ant-Man sequel, as there’s plenty of potential there. (I’ll be honest – Evangeline Lilly turning out to be The Wasp, or a version of The Wasp at the end of the movie was all I’d really hoped for from Ant-Man, so I may have punched the air at that moment). In terms of The Wasp’s potential, her comic book history is rich with possibilities. As well as co-founding The Avengers and giving them their name, she has also been a long-running leader of the team, something that could well happen in the MCU if the Avengers movies continue (in 2020 and beyond) without key players like Captain America, Thor and Iron Man. 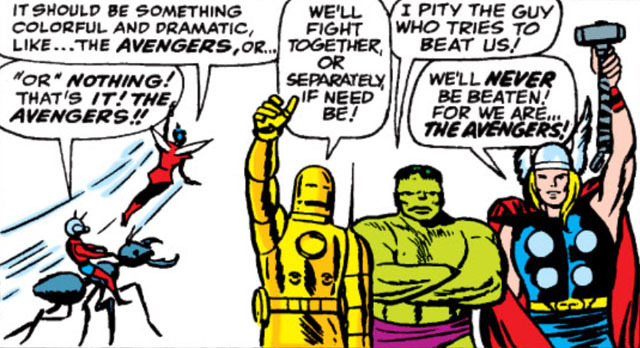 Sadly, however, the MCU’s rewriting of Ultron as the invention of Tony Stark means we’re unlikely to see one of the best Wasp storylines, when she’s kidnapped by Ultron and has her brain-waves implanted in a robot bride named Jocasta (who, of course, later becomes a member of The Avengers), in a neat twin homage to Bride of Frankenstein and Metropolis. The end credits of Ant-Man feature a caption promising that “Ant-Man Will Return”, James Bond-style, with the post-credits sting confirming that the tiny hero will next be seen in Captain America: Civil War. (Marvel head honcho Kevin Feige is on record as saying that that Lilly won’t be joining him, but I wouldn’t rule it out). At the time of writing, the studio has yet to confirm an Ant-Man sequel, but it’s holding its own at the box office, so hopefully that comfirmation will only be a matter of time. Note: Thanks to James Moar for valuable Ant-Man facts.